As if beach-nesting birds don’t have enough problems, along comes a new scourge: nudists. Brings a new meaning to the term “shake your tail feathers”! Disregard what Mary Poppins advises; in Swansea, UK, feeding the birds will cost you (and a whole lot more than tuppence). Magpies sometimes get a bad rap, but a new study finds that kleptomania shouldn’t be part of it. Some jerk (I’d use a stronger word, but this is a family-friendly website) in Wisconsin is shooting raptors. Birding in the Bronx? Yep, at the Dred Scott Bird Sanctuary. San Francisco aims to study and deter birdstrikes; participants can earn “bird-friendly resident” honors. Another study, led by the U.S. 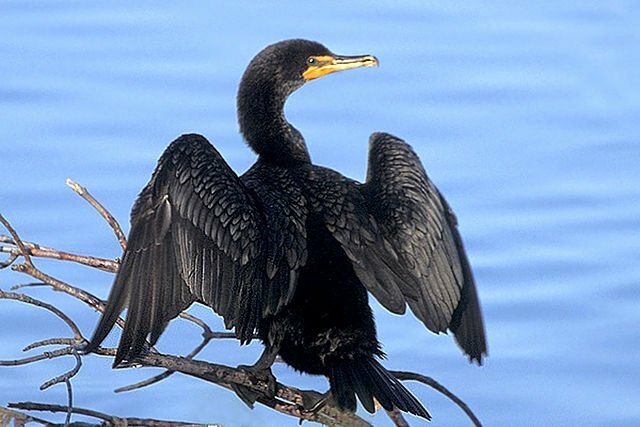 Fish and Wildlife Service (USFWS) in Maine, will use “nano-tags” to track migrating birds. The USFWS (along with another federal agency) is facing a lawsuit that blames solar-power plants for killing endangered Yuma Clapper Rails and other birds. Why the hummingbirds at your feeder demand sugar, sugar, and more sugar, even though birds lack a genetic sweet tooth. Science! In still more food news, pollen traces indicate where birds migrating to Britain make pit stops.